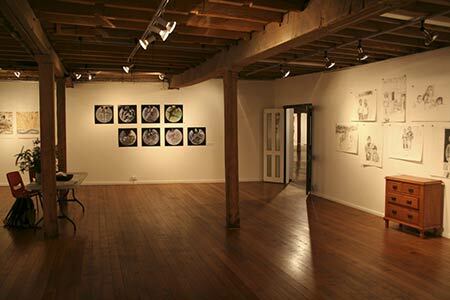 The Sidespace Gallery is a professional exhibition space that is accessible and affordable for solo artists and small group exhibitions. This gallery is part of Salamanca Art Centre’s subsidised Access Galleries program and is offered to Salamanca Arts Centre Associate Members on the acceptance of an exhibition proposal. A quirky gallery with perfect proportions, the Sidespace Gallery is the gallery of favour for artists wishing to exhibit contemporary work in the public domain. Selected applicants are offered reasonable rates for this outstanding exhibition space. Facilities include contemporary track lighting, demountable hanging panels, lift access and a heritage servery table. SAC Assesses applications for the Sidespace Gallery twice annually, with the due dates for submissions as 30 April and 30 September each year (excluding special rounds). Salamanca Arts Centre is currently seeking applications for inclusion in the Sidespace Gallery 2020 calendar. For more information on the hire of the Sidespace Gallery, please DOWNLOAD the Sidespace Gallery Conditions of Hire (PDF). To be notified of the next Call for Applications for the Sidespace Gallery, please complete the ALERT ME Online Form and you will be contacted once the next Call for Applications opens. CLICK HERE to view the available dates in the Sidespace Gallery Calendar. Please note: The Sidespace Gallery Calendar for 2019 is FULL; Applications for 2020 are currently OPEN. For any other queries in relation to the Sidespace Gallery, please contact the Venues Manager via email. Osmosis (2010). Photograph by Fiona Fraser. Sidespace Gallery. Photograph by Fiona Fraser. AUSLANDER (2014) by Nina Keri. Photography by Fiona Fraser. When the Crucifix becomes the Sword (2014) by Julie Winlow. Photography by Fiona Fraser. Burnt Rubber… (2014) by Donna Ritchie. Photography by Fiona Fraser.